At present, iPhone keeps deleting messages without asking and notification becomes a pervasive problem among iPhone users. Questions, like "My messages keeps deleting, how do I stop it? ", "Why iPhone keeps deleting my messages on its own? ", "Messages keep getting deleted from my inbox, how to fix it?" etc. are raised in forums, communities and question-and-answer sites, which is enough to show the universality and urgency. Hence, in this article, we will give you tips and solutions to get out of this trouble. 1. 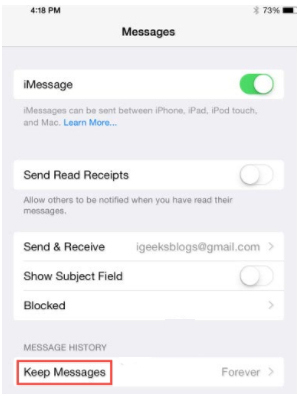 Enable "Keep Messages" as "Forever"
Apple designs an auto-delete option in "Messages" considering iOS users are not allowed to clear up all messages at a time. Once this function is enabled, your iPhone will automatically keep deleting messages without confirming with you again. As a result, to avoid iPhone text messages disappear from inbox or other categories, you can go forward to "Settings" on your iPhone, scroll down to find "Messages" and turn on "Keep Messages" feature as "Forever" under "Message History". This method is now regarded as the top priority to fix messages automatic deletion issue. In fact, iTunes can serve as a handy tool to back up files from iPhone or other iOS devices. It comes with "Automatically Back Up" and "Manually Back Up and Restore" settings, which do you a favor to sync the latest iPhone data to your computer or iCloud. It is worth mentioning that you can restore backup to recover deleted messages if you find iPhone deleted messages by itself. 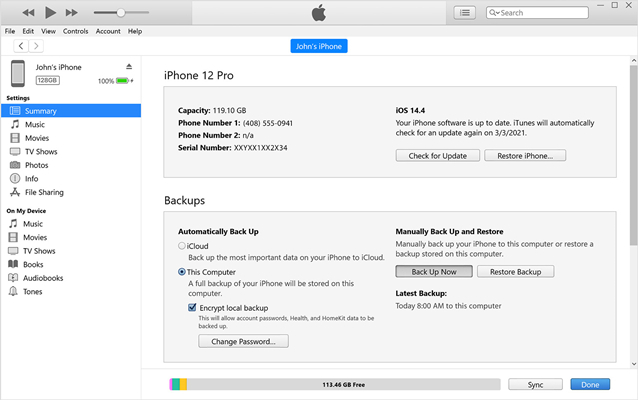 Step 4: Go to "Summary" > "Backups" to choose a way to back up your iPhone data. Suggestion 3. 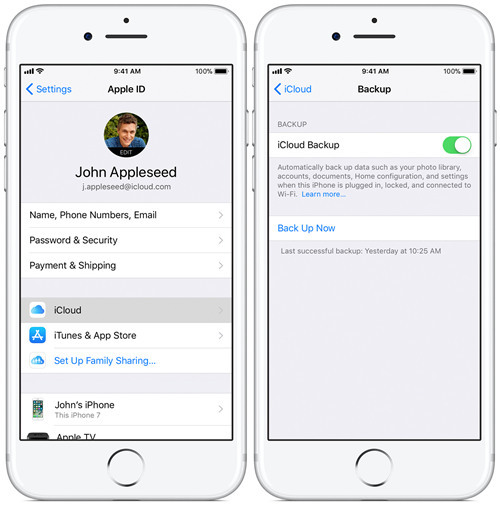 Turn on "iCloud Backup" on iPhone "Settings"
It is advisable to right away open iCloud backup function on "Settings" if your iPhone randomly deleted messages before. By doing that, data files will be automatically backed up and synced to your iCloud account as long as there is a Wi-Fi network. This method is incredibly easy-to-operate. What you have to do is just go to "Settings" > "iCloud" > "iCloud Backup". Keep it on so that you can escape various data loss disasters, including factory reset, iOS upgrade, virus attack, etc. Step 3: Turn on "Contacts/Text Messages" and press "Merge" to get deleted ones come back. 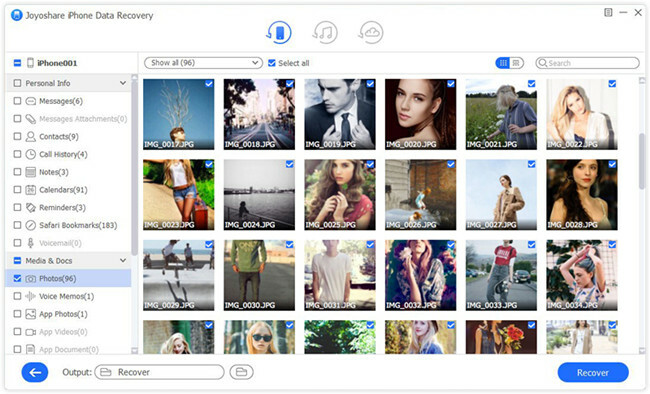 The one, who feels like to restore deleted iPhone messages in a professional and secure manner, had better select a dedicated 3rd-part tool as a medium, for example, Joyoshare iPhone Data Recovery, which can search and recover messages at fast speed with full support to all recent iOS models, including iPhone XS/XS Max/XR and be compatible with the latest iOS 12. Here's how. Step 3: Preview detailed items in real time and selectively choose needed messages files to recover with a compact "Recover" button.